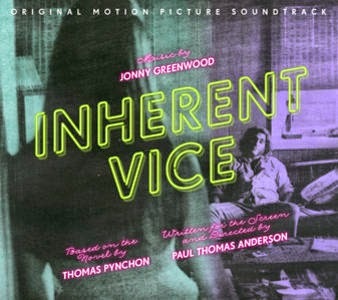 Nonesuch Records will release Jonny Greenwood’s soundtrack to Oscar-nominated filmmaker Paul Thomas Anderson’s new feature film, Inherent Vice, on December 15, 2014 (with the vinyl to follow March 3). An adaptation of the Thomas Pynchon novel of the same name, Inherent Vice, which will be released by Warner Bros. Pictures in theaters starting on December 12, is set in the tail end of the psychedelic ’60s and stars Oscar nominees Joaquin Phoenix, Josh Brolin and Owen Wilson. In addition to nine compositions by Jonny Greenwood, the soundtrack features “Spooks,” an unreleased Radiohead tune performed by members of Supergrass, as well as other recordings from the movie’s era (complete track list follows). Additional performers include The Royal Philharmonic Orchestra, Neil Young, Can, and The Marketts, among others. Widely known as the guitarist for Radiohead, Jonny Greenwood also is a highly respected composer. In addition to There Will Be Blood and The Master, Nonesuch also released his score for Norwegian Wood and his collaboration with Polish composer Krzysztof Penderecki last year. It's fun, it's stylish and I really enjoyed the great music from this film!